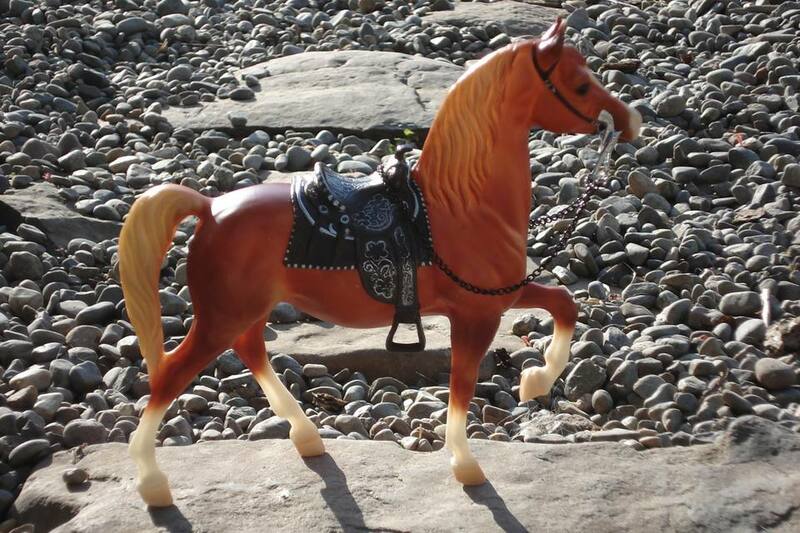 After you've enjoyed collecting and halter showing your Breyer and other model horses, the next natural step is to begin performance showing. Although you can purchase plenty of nice photo show quality tack and accessories from Breyer or artisans hand-crafting model horse tack, there's a certain pride and satisfaction you get from making your own. If you're ready to get started making model horse tack, assemble the materials you'll need for your first project. Before discussing materials for making tack for Breyer horses, it's important to talk about what your first project will be. Generally speaking, halters are easier to make than full bridles and saddles, and many collectors begin with a simple halter and lead shank project. The instructions for the braided Arabian halter with tassels call for embroidery thread, which makes a great scale-size model horse halter. However, other tack should be made out of leather or a reasonable fascimile. You can practice on scraps of cloth first such as felt, but saddles, bridles and show halters are all made out of leather. For making show halters, leads, bridles and saddles of all types, you'll need the following basic materials and equipment. Leather lacing - leather lacing is used for halter side pieces and nosebands, reins, lead shanks and stirrup leathers. Leather - you can purchase leather by the foot or yard from online hobby suppliers. Old leather purses, wallets and even shoes can be cut apart and used for crafting leather, too. You can find old leather goods at thrift stores such as Salvation Army, Goodwill and St. Vincent de Paul Society shops nationwide, or at yard sales, thrift stores, consignments shops and other stores that sell used goods. Jump rings - jump rings are O - shaped rings sold in the jewelry making aisle of craft supply stories. They make great snaffle bit rings or halter rings. Metal buckles and stirrups - these are specialty items you can find at suppliers such as Rio Rondo, a model horse hobby supply store, or on eBay. They need to be in the same scale as your model horse and tack. Sharp scissors - most hobbyists have two or more pairs of scissors on their craft table. A large pair of dressmaking shears helps you trim big pieces of leather, while small, sharp needleworking scissors can cut small pieces. Sharp knife or razor blade - this helps you scape, or skive, the end pieces of leather before you join them together, reducing the bulk to fit the pieces neatly. Always exercise care and caution when using sharp knives and razor blades. Children should always ask their parents for help and should not try skiving leather on their own. Work light - a bright worklight reduces eye strain and helps you see all the tiny details of your miniature tack projects. Ruler or tape measure - as with all miniature projects, it's important to measure each piece accurately so that you won't waste materials or run short during the project. There are other supplies you will need, depending on the piece of tack you are making. A lead shank might need a short length of chain for the end that is in scale to the model horse. Western parade sets may require metal pieces, which can be cut and stamped from an old can or pie plate. Arabian costumes are made of silk or similar cloth, with a frame underneath and fancy beading and trim. The list above provides beginners with a good set of simple, useful and affordable resources available online. This is where your model horse project reference library comes in handy. If you've been clipping photos from magazines, catalogs and other resources and saving them in a file or an old shoe box, you've got plenty of inspirational project images to choose from to start your project. It's helpful to actually see and handle real horse tack in person before making it in miniature scale. If you can visit a horse farm or ranch, look carefully at the tack and how it fits together. If you don't live near a real horse farm or ranch, look at catalogs, videos and other pictures closely to see how it fits together. As with all craft projects, practice makes perfect. Take your time and work slowly and carefully. Your first project will probably not be live show quality. Kim Ford Hoffman, a well-known hobby artist who makes live show quality tack, reminded readers in the interview with her that it took her years of practice to make the beautiful sets she makes now. Practice is the key to success.